Specialists in nervous system disease dysautonomia from The University of Texas Health Science Center at Houston (UTHealth) Medical School were invited to present their studies at the 2015 Dysautonomia Seminar. The open event, which is designed not only for medical professionals but also for patients and other interested participants, will take place on Saturday, April 25 in Texas. 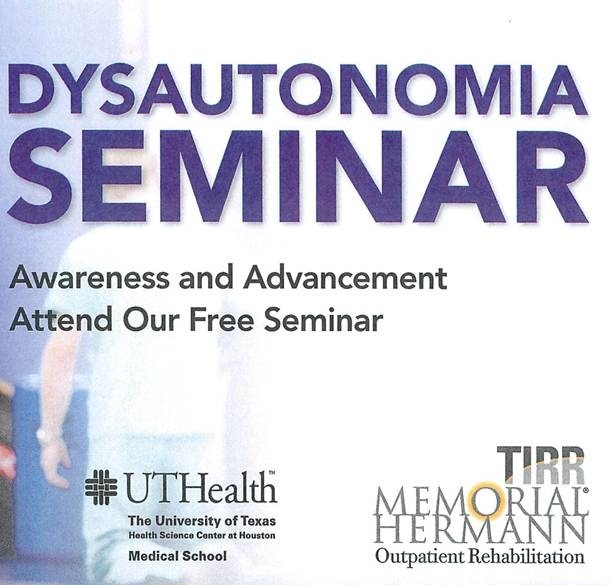 The 2015 Dysautonomia Seminar is being organized by the Children’s Memorial Hermann Hospital, TIRR Memorial Hermann Pediatric Rehabilitation and UTHealth Medical School, and will be held between 8:30 am and 3 pm at the Hermann Pavilion Conference Center at Children’s Memorial Hermann Hospital, 6411 Fannin St. The educational event is free and open to anyone willing to participate, including pediatricians, general practitioners, pediatric neurologists and pediatric cardiologists, as well as physiatrists, physical therapists, caretakers, patients and other people concerned about dysautonomia. The topics addressed at the event range from signs, symptoms, biology, research projects, and gastrointestinal topics, to dealing with the condition in children and adolescents. The UT Health investigators invited to present at the 2015 Dysautonomia Seminar include Ian Butler, MD, a professor of pediatrics, director of the Division of Child & Adolescent Neurology and Jacobe Geissler Distinguished Chair in West Syndrome Research, Mohammed Numan, MD, an associate professor at the Division of Cardiology, and Jeremy Lankford, MD, an assistant professor of the Division of Pediatric Neurology. In addition, Melissa Van Arsdall, MD, an assistant professor at the Division of Gastroenterology, Holly Varner, MD, an assistant professor at the Department of Neurology, and Glendaliz Bosquez-Mendez, MD, an assistant professor at the Department of Physical Medicine and Rehabilitation at UTHealth, are also going to present at the event, as well as Jessica Dalmolin, DPT, and Kathy Carrico, LCSW, from TIRR Memorial Hermann. Dysautonomia is a pathology of the nervous system that includes a series of malfunctions caused by abnormal functioning of the autonomic nervous system (ANS). The ANS is responsible for the regulation of the body’s unconscious tasks, including the heart beat or the breathing, and it affects the transfer of information from the brain and spinal cord to the organs. In severe cases, it can even provoke the malfunction of the cardiovascular, gastrointestinal, metabolic and endocrine systems, causing organ failure.